Ivan James, under jockey Raul Ramirez, Jr., drives to the finish in the Grade 2 Sam Houston Futurity at Sam Houston Race Park Saturday night. 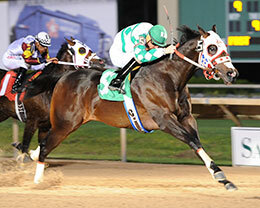 HOUSTON, TX�APRIL 25 2015�The finals of the richest race of the 2015 Quarter Horse Meeting, the $621.100 Sam Houston Futurity (G2) took place tonight at Sam Houston Race Park, and the honors went to the fastest qualifier, Ivan James. Breaking from post position five under rider Raul Ramirez, Jr., the bay colt led gate-to wire, drawing off to a 1� length victory. He covered 330 yards in :16.701, faster than his maiden-breaking trial win in 16.748. The son of IVORY JAMES out of the Dashin Bye mare First Dashin Bye is bred and owned by Jorge Meraz of Bastrop, Texas. Trained by Angel Sanchez, Ivan James now posts a perfect two-for two career record and earned $248,440 this evening. Meraz also bred Ivan James and as well as Miss Aguilar, a Tres Seis filly, who finished fourth. He was joined by family and friends, but took a minute to acknowledge Ivan James� dam, First Dashin Bye. Ivan James was sent off as the favorite and returned $3.80 for the win. This Is A Deal, a Dealagame gelding owned and bred by Pete Scarmardo,ran second, followed by tenth-fastest qualifier Ec Jet One and Miss Aguilar. Leon Bard saddled This Is A Deal for owner/breeder Pete Scarmardo. The Dealagme gelding is form the First Down Dash mare Lady Lilia. Ridden by jockey Francisco Calderon, This Is A Deal earned $99,376 for the runner-up effort. Ec Jet One is also a homebred racing for owner/breeder Enrique Carrion and trainer Leslie Padilla. The bay colt is by first crop sire The Louisana Cartel out of Pretty Girl Perry, by Mr Jess Perry. Ridden by Esgar Ramirez, Ec Jet One picked up $68,321. Miss Aguilar, Tempting This Snow, Hi Hoppin, Winschke, Apachedashing and Mighty Zapata completed the field. Nexxus was scratched. This was the first Sam Houston Futurity title for Sanchez, who served as assistant to Duane Hartsell when he won the 2002 title with Shiney Sign. It was also the first win in the prestigious race for the 33-year-old Ramirez. His brother Saul won the 1994 edition of the race aboard A Touch of Victory as well as the 2010 Sam Houston Futurity with Sixes Liaison. Their cousin, J. R. Ramirez was victorious in 2002 on Shiney Sign. This is the largest purse for the Sam Houston Futurity since its first running in 1994, with the winner receiving $248,440. The previous highest purse was $600,000 in 2011. This year's champion will join a noted list of the Sam Houston Futurity, which includes 2014 AQHA Champion 2-year-oldKiss My Hocks (2014) and Azoom. who won 11 races in 2004. Other notable winners include Snowy Alibi, Sassmaster and Jess Tee Off.